Coming to Brussels this week, it’s be heartening to see so much discussion of key international developments, coupled to an emergent sense of collective identification. Sadly, the World Cup and the Red Devils’ successes remain of limited interest to me. However, I do find it telling that the heat of public debate that followed the European elections last month has largely gone, even as the issues remain. This is evident in a couple of cases. Firstly, the formation of groups in the Parliament is entering its final stages, before the round of internal elections for institutional posts. Last night’s announcement of the admission of the Sweden Democrats and a FN defector to the EFD group confirms that they have reached the minimum threshold for the group’s existence. This represents an important success for EFD, which had been looking decidedly ropey after the shift by several groups to the ECR and the putative EAF. The very minimalist politics of the EFD (essentially – agree you don’t like the EU and do as you like for everything else) should have made this easier than it was, which actually then reflects how much it was group of convenience in the past Parliament for those without other options. Those other options have really come on. The ECR is now the third largest group, following the N-VA’s decision to jump from ALDE. At one level this looks like a vindication of the Tories’ decision to leave the EPP back in 2006, since they will have a good level of access to positions of influence. But on another, it highlights the limits to their influence – the decision to admit the AfD was close, but it offers an additional complication for any renegotiation of British membership. Ironically, it is now the EAF group that looks weakest, having made the early running with its FN-PVV base. Having pulled in a good number of MEPs, the group still only has six member states represented, one short of the threshold. The remaining options don’t look very appealing, as the Pirate’s @Vilinthril noted, especially if the various radical right parties are serious about ‘dediabolisation‘. The counteracting pressure will be access to funds and status, so noses might have to be held. Away from the EP proper, the Spitzenkandidat saga rumbles on. The current phase seems to be one of holding off making a decision, to take some of the tension out of the situation, having gotten turned into a dead end. The British decision to come out so strongly against Juncker looks ever more misguided. Along with all the other member states, the UK failed in seeing where the EP’s strategy would lead, but at a time when building some good will might be in order, Cameron seems to be playing the role of useful idiot once more, providing public cover for the doubts of others. Cameron doesn’t even benefit much from his opposition, especially once the other UK parties swung behind him, closing the political space. 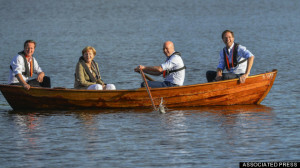 The dinner at Ypres might provide a way out, but someone will have to back down, possibly via the ruse of building a clear programme from the Commission, in the model of the Sweden meeting between Cameron, Merkel, Rutte and Reinfeldt. That such an option is even open should remind us that the Commission president doesn’t enjoy that much power, especially since their scope to overrule the rest of the college is limited. All of this doesn’t bode well for the other posts to be filled: European Council president, Foreign Minister and the rest. But for now that has to be put to one side as a modus vivendi is found between the EP and the member states. Both the EP groups and the Spitzenkandidat question will be live issues for a while yet, and both will have lasting consequences for the EU and so it’s right that they should be discussed as such. However, both have taken the focus off the election results in the broader sense and the discontent expressed there. Whether or not the Union will come back to that in the fullness of time is not clear, but the initial signs are not too promising: the system has absorbed the shock, so the system must work, seems to be the view.